No GBT today as we are a little under the weather. Comments are back on line so feel free to leave your GBTs there and of course we will be restarting the “Sunburst PoG” tomorrow. THE GOOD: It seems like slowly but surely, Pat Burrell is coming around. He's starting to get RBI even if the extra base hits aren't there yet. THE BAD: It is completely inexcusable for a major league team to have a runner on third with NO OUTS and not get that run home. I don't care if you're wrapped in a straitjacket and your bat is on fire. THE TELLING: I got to attend the 14-5 win on Saturday. There were lots of Rays fans in the next section over, including the most adorable toddler to ever grace a Carl Crawford shirt. That child got to witness Pat Burrell's stolen base - it's possible no one else in her lifetime will ever see such a spectacle. The schedule gets a little easier with 10 straight games against last place teams. But you can't blame the Rays for losing the series at Fenway. couldn't put one ball in play, pena and upton then crawford struck out. They also gave the Red Sox two more runs with that pop fly by Aki or Zobrist and Willie throwing the ball to home, you know Pena makes that play. 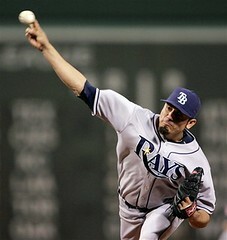 Still the Rays are playing a lot better hopefully they carry it into their next games and start gaining ground. I was there, too. And right in the first row. I got to watch myself on TV and everything. Unfortunately, you couldn't see my Rays gear on the TV. Didn't see too many Rays fans, but there were at least 3 of us in the lower section behind homeplate. Great choice of games. Nice. I was in the right-center bleachers about 20 rows behind the Red Sox bullpen. Funniest thing I heard all night was a very upset lady to my right yelling "Lugo, rot in hell!!!" It was a great game though. Weather was great despite the clouds, and as much as I am not a Sox fan, I really do like Fenway Park. when I saw the headline I thought Kevin Kennedy was fired. Damn you for getting my hopes up. How doesn't Tom Foley send Aki home on Bartlett's single? I've been down on Foley as a 3B coach for years. Too many holds. Switch him to 1B (I know he is a good guy and invaluable on the staff) and get me somebody who wants to press the action. Have to tie the game, force a throw, get Bartlett to 2nd. Upside is they are having "good" losses again -- rarely blown out, always fighting in the last 2 weeks. That looks like the 2008 team and will ultimately even out now that we don't see Boston for a few months. They showed a wider camera angle, you're right, Aki held 15-20 feet past second to make sure the ball fell in. Aki would've been thrown out had he attempted to go home. In the loss with the Red Sox, at least we have some humor from Minnesota - "last year's traded wasn't so bad for the Twins." The trade is looking more lopsided than ever. The Twins insist on playing Young in LF where he is dreadful and Harris will never be more than a backup in MN. Garza wasn't well liked by the Twins staff so they kind of had to move him, but I'm betting they wish they had made a different trade.